George Mueller (1805-1898) opened an orphanage in Bristol, England, in 1835 that saw thousands of abandoned children saved. Armed only with prayer and faith, which were the vital components of his nineteenth century ministry, George Mueller ministered for over sixty years. Through this narrative account, Mueller reveals how powerful and spiritually rewarding prayer can be in your life. George Mueller was a truly great man of God, but he wasn't always so. As a youth, he was a thief, a liar, and a gambler, but God's grace brought about a 180-degree turnaround in his life. After that happened, Mueller learned about the power of prayer, which taught him that: God is real, God is completely trustworthy, and God answers prayer. He wrote, "There was a day when I died, utterly died, died to George Mueller, his opinions, preferences, tastes, and will. Died to the world, its approval or censure, died to the approval or blame even of my brethren and friends, and since then I have studied only to show myself approved unto God." As you read the bountiful and miraculous answers to prayer that are reported in this book, don't be surprised if you feel a stirring within your spirit that becomes a desire to pray and ask God to use your life for His glory. Customer Reviews For "Answers to Prayer"
If you're looking for a comprehensive biography of George Mueller this is not it. However, if you want a fast paced book with many excerpts from his journals documenting his struggles and the answers to his prayers this is what you want. There are countless concrete situations where God has answered his prayers mightily, in the toughest of situations. The faith of Mueller is great, never doubting that God would provide. A great encouragement for any Christian, especially those doubting the power of prayer. The writings of Mueller are an inspiration and encouragement to pray. This book is a compilation of excerpts from his dairies. Occasionally, an editorial comment sets the context for the letter or provides background information. The book is quite small and easily read. Reading the writings of Mueller's life provide a good autobiography of his life, although this format is not a traditional story of life format. 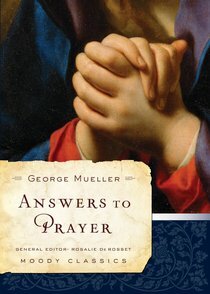 This book is an excellent introduction the Mueller and an inspiration to prayer. Well worth reading for all Christians.